Let AI turn your boring snap into an inspirational '90s poster. Photo retouching and style matching (not to be confused with Prisma-like Instagram filters) is challenging work that requires a trained eye and hours of labor. At least, it was, until AI took that job, too. Researchers from Adobe and Cornell University have showed off an experimental app called "Deep Photo Style transfer" that can transform your image from drab to dramatic using someone else's photo. As shown above, using it is pretty simple -- you just select a photo you want to change and one with the style you're trying to emulate. The AI does the rest, applying the color, lighting and contrast of the example photo to the original. It can transform a lake photo snapped in the most boring light possible (above) into one that looks like it was taken at the golden hour on another planet. In another example it transforms a daylight city shot into a much more interesting nighttime scene. The researchers built on the "Neural Style Transfer" work done by European researchers. They refined it so that the style transfer only happens to colors and doesn't distort objects in the picture, like previous deep learning systems. In other words, it can pick out which part of the image is sky and which part is ground, so that the sky doesn't "spill over" into the rest of the image, the team says. The system works well on a wide range of photos, including a flower shot, drab house along a road and a temple scene (above). 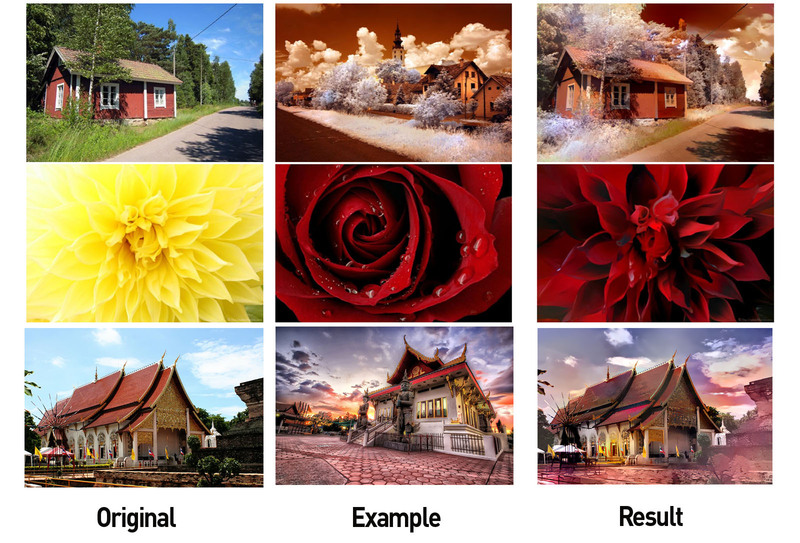 The team did a study and found that viewers judged the photos to be faithful to the example style 80 percent of the time, much better than more basic methods like Photoshop's "match color setting." The next step, the team says, is to improve the way that the AI divides up the image to create even more precise color settings. Adobe hasn't said whether it plans to implement this in Photoshop, but if you have Linux and want to try it right now, you can download the app, complete with examples, from Github.